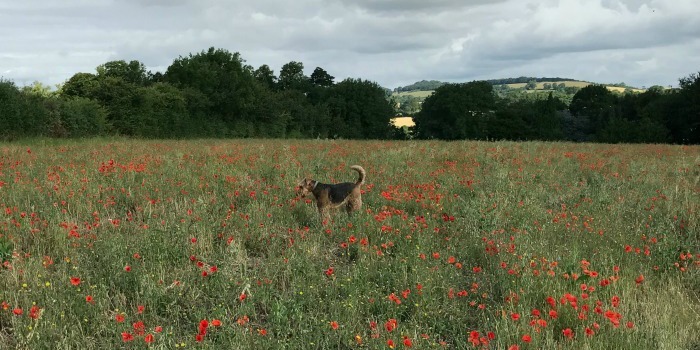 We were heading off on Basil’s favourite morning walk to Badby Woods recently when he disappeared into this beautiful field of poppies. Their appearance is always a sign of high summer and there is something so spectacular about glimpsing a dense array of red dancing in the summer sunshine. Sadly our walk was lacking the sun that day but we were both still happy to see this symbol of summer. 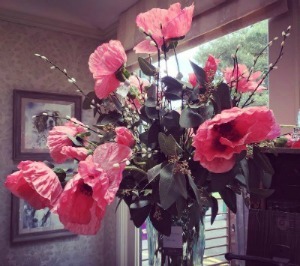 If you’d like to bring a little Poppy sunshine in to your home, inspired by Basil’s photograph, Louise has worked her magic in the shop and put together several beautiful floral arrangements using our stunning faux poppies. Basil has given them all ‘paws up’ but definitely prefers to be running amongst them than seeing them in vases. 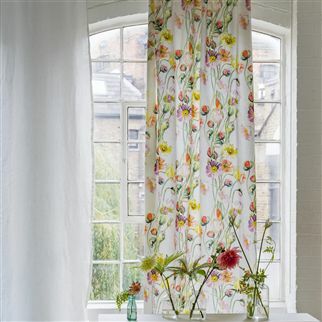 Or if you’d like to enjoy poppies in your home all year round we also have some beautiful fabrics by Designers Guild and Voyage Decoration that would make stunning curtains, blinds or cushions. Drop in to see us and maybe talk to Louise about putting together a bespoke arrangement for you, or simply browse our many beautiful fabric books. Basil will be ready to welcome you with a tail wag and his wet beard!